Time outdoors improves physical and mental well-being for children of all ages, but they don’t care about that. So how do we get them out and about? Despite the many benefits of outdoor activity, kids are spending less time outside than ever before, with some studies suggesting that 75% of children are spending less than an hour outside each day—in many cases, less than the average prison inmate. This lack of outdoor time can potentially contribute to health problems including child obesity, anxiety, depression, and ADHD in the short term. In the long term, lack of outdoor activity may predispose them to certain health problems, including heart disease, high-blood pressure, high-cholesterol, heart attacks, and strokes. Yikes! So, why are kids spending so much time indoors? Some of the reasons might include parental concerns about neighborhood safety, lack of interest among children, school cutbacks of mandatory physical education classes, and lack of funding for sports. Whatever the reason, this means that it’s now our responsibility to make sure our children get their healthy share of the outdoors. With social media platforms, smartphones, and all kinds of video games being commonly used by kids as young as three, this generation may have little incentive to play outside—especially if their friends spend most of their days glued to a screen as well. That’s why it’s important to limit screen time for kids; doctors advise that children 2 to 5 years old shouldn’t be exposed to screens for more than an hour a day. Older kids may need a more specific prescription, but it’s usually a good idea to cap elementary and middle school children's screen time at 3 hours. Instead of making a specific cap, you may simply want to balance their screen time with outdoor time. For example, for every minute your child spends outside, they can get 2 minutes of screen time. This means that to earn 2 hours of screen time, they would have to play outside for 1 hour. 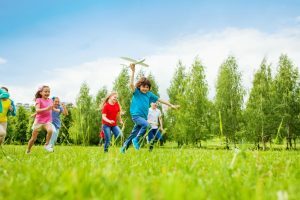 This is a great way of encouraging your children to get outside more and help them begin to understand the fundamentals of living a healthy, balanced lifestyle. If you have a backyard, no matter how small, make an attempt to transform it into a safe and welcoming play area for your kids. Even when working with a tight space, you can easily create an area that your children will love. Finding the right size trampoline for your outdoor space can be one of the most fun and effective ways to get your kids out the door and moving around. (If you feel the need to spontaneously join your kids, we totally won’t judge.) Trampolines are also clean, unlike a sandbox or other dirt-based play methods, and safe as long as you make sure to purchase a kid-friendly, enclosed trampoline. In today’s hurried, harried world, it’s common for families to jump in the car to travel to a destination as little as 3-4 blocks away, but your family doesn’t have to do it that way. Set an example for your kids and walk with them when traveling to local destinations like the post office, a restaurant, or a nearby relative’s house. If those destinations are unreasonably far, simply taking an evening walk around the neighborhood a few times a week is a great way to jumpstart your children's outdoor time. No matter how you get them moving, an active lifestyle is something that will serve children well their entire lives and reduce their risk of health issues caused by being too sedentary.